Shawn Martin (lower left) was arrested in Polk County for possession of marijuana and has a felony warrant for his arrest out of Montgomery County. Heavy Window Tinting Attracts Law to Felon On the Run, SEVEN OAKS, January 14, 2010 - Shortly before 3 pm on January 14, 2010, Lieutenant Andy Lowrie and Sergeant Howard Smith (both with Polk County Sheriff's Office), pulled over a north-bound older model red Accura driven by Michelle Lynn Hudson, 32, of Conroe. Hudson pulled over on the right side of US-59 in Seven Oaks. 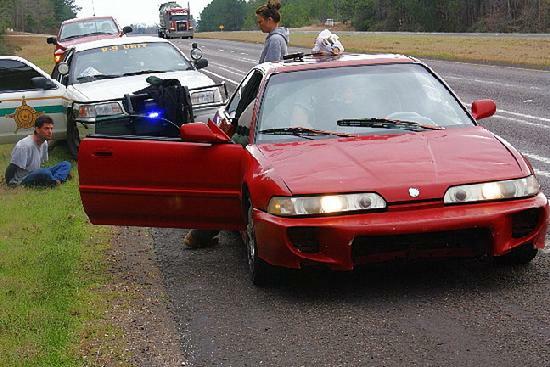 Hudson's vehicle had heavy window tint that aroused the suspicion of Lowrie and Smith. After running a check on Hudson and her passenger, Shawn Martin, 35, also of Conroe, it was discovered that Shawn Martin had a felony warrant out for his arrest out of Montgomery County for multiple DWIs and his probation had been revoked. 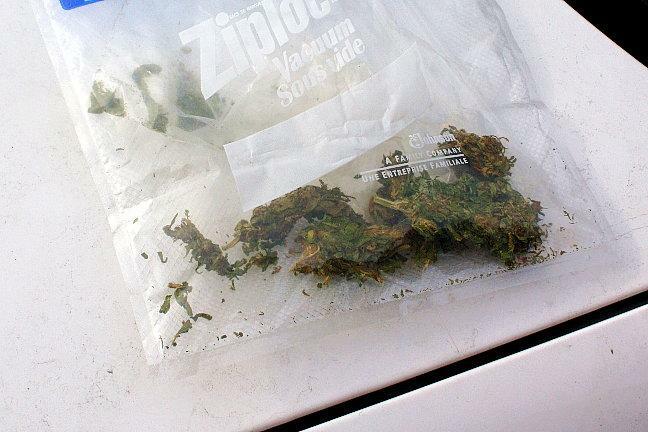 A search of Martin and the vehicle rendered a baggy with marijuana. Martin was allegedly on the run trying to skip out on his arrest warrant and was allegedly enroute to the State of Ohio in an attempt to avoid prosecution. Martin was placed under arrest and booked into Polk County Jail for possession and faces other charges in Montgomery County. Michelle Hudson was issued a citation for no insurance and allowed to drive away. The scene was cleared before 4 pm. 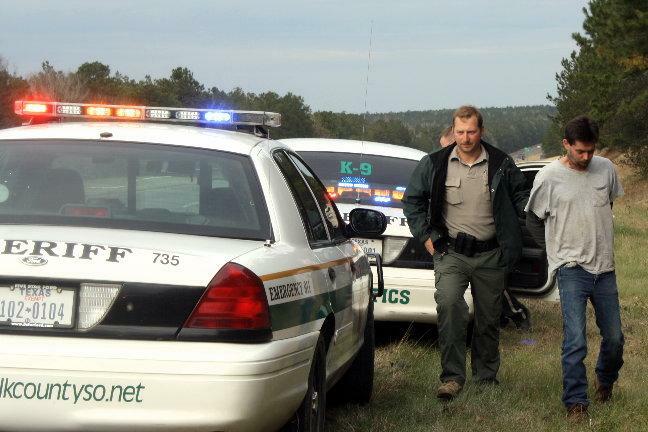 Lieutenant Andy Lowrie (left) stands guard as Sergeant Howard Smith conducts a vehicle search. Marijuana was found in Shawn Martin's possession. Sergeant Howard Smith escorts Shawn Martin to a waiting transport unit.